Neil's recent comment that music can't change the world has been met with a pretty strong reaction from around the world. Many argue that music can change the world while others argue that it never has and never will. "No one song can change the world. But that doesn't mean it's time to stop singing. This is the age of innovation. Hope matters. But not hope alone. In the age of innovation, the people's fuel must be found. That is the biggest challenge. Who is up to the challenge? Who is searching today? All day. All night. Every hour that goes by. I know I am. My friends write to me don't give up. I am not giving up. I know this is the time for change. But I know that it's not a song. Maybe it was. But it isn't now. It's an action, an accomplishment, a revelation, a new way. I am searching for the people's fuel. Will I find it? Yes. I think so. I don't know why I may have been chosen to help enable a discovery of this magnitude. I know I can only write a song about it when I find it. Until then I can write a song about the search or spend all my time looking. But a song alone will not change the world. Even so, I will keep on singing." Yes, please, keep on searching. And keep on singing Neil. Berlin Film Festival, 2/8/08 - Photo by Stephan "Moonshiner"
" I am searching for the people's fuel. I don't know why I may have been chosen to help enable a discovery of this magnitude." ??? The people's fuel?? Sorry but what is he talking about? And he's chosen? By who? It's Neil Young. Not Albert Einstein. Not McCain and Huckabee even though I think John Fogerty already covered that one recently. It's not the song that can change the world, but sometime the singer can. And the above line illustrates that the playing can color the context in which the song was born. "Ohio" didn't stop the War, but people were and are inspired by the lyric, and it's their influence that changes the world. It's the realization that "we are the people we've been waiting for" that brings change. 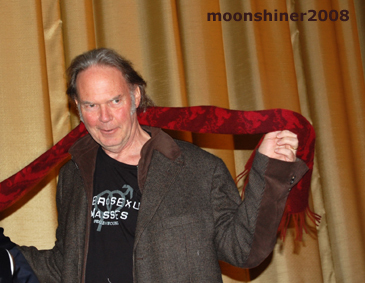 Neil Young can think or say whatever he wants, but the "air is magic when he played." You have spoken quite eloquently about your creative process, about how important spontaneity and intuition are. Creative activity, like music, can also lubricate the gears of creativity, perhaps in the head of that scientist you're talking about, or in the head of a young scientist to be. Tom, You think he spoke eloquently or are you being sarcastic? I understood the connection he was trying to make about our survival as a species & scientific discovery, but it's always hard for me to understand what he's saying until he puts it in a song ... then I get it. Do you think he has a learning disability? Maybe dyslexia or something? Not sarcastic. I was thinking of other interviews, when he has been quite clear about how he doesn't try to force creativity, how he knows to let it flow when it's there, etc. He is pretty far from being any precise academic, that's for sure. He's an artist, he's a dreamer, he can be both impulsive and calculating, also woefully inarticulate at times. "That guy just keeps singing, can't somebody shut him up, I don't know where for the life of me he comes up with that stuff." Information overload is correct it can't be kept up with in a song, on the news, in a War, in a iPod or whatever. The memory cells in our brains are being exceeded by the giga -bytes in our hard wired life and therefore nothing sticks. I believe that Neil is speaking to a meta-physical transcendence based on spirituality that will reverse this trend and allow people to feel again. When you feel again, you dance and you can really love and that my friends creates change. what does that t-shirt say? music could change the world when there were groups of people that stood for something and were on the same wave length, music was a way to get a message out about changing the world, the mass was enough to demand and create change, now people do not stand together or for anything, mostly against each other and everything that does not profit the individual, the people of this world are very selfish, and until there can be a common bond such as "spirituality" among people music will not change a thing.